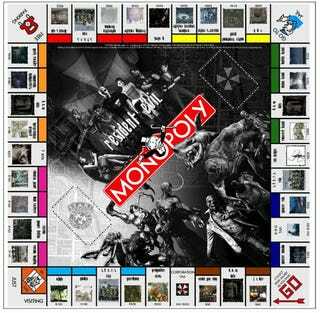 Sensing that Capcom and Hasbro were never going to release an official version, Nicholas Endean decided to make his own Monopoly: Resident Evil Edition. And make one he has. No expense has been spared: two boards have been crafted, and Nicholas has even gone to the trouble if re-writing every single Chance and Community Chest card. Every location on the board has been replaced with one from Resident Evil, and it's all even been printed in colour. About the only things it doesn't have are custom money and pieces, though Nicholas says he's working on those now. Makes you wonder what other properties, Nintendo aside, could work as Monopoly games. Grand Theft Auto? SimCity? Mass Effect?